UPDATE 2015, Volcan now has 4 excellent quality restaurants. Our supermarkets have increased to 10 and plans are underway for a three story covered shopping mall (be still my heart). There seems to be a building boom underway with new shops, stores and restaurants. However, we still have affordable accommodation for sale and rental. 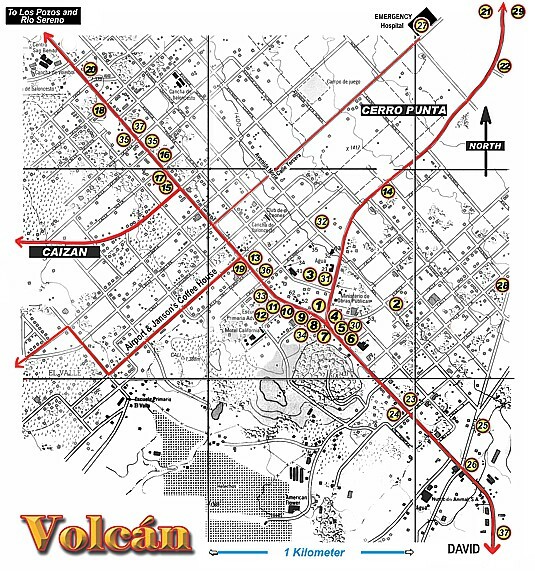 Volcan has been around since about 1900, Orginally it was a collection place for cattle. In the mid 1930's immigrants from Europe and the United States discovered its great climate and productive volcanic soil. Today the "Shangri-La " Valley of Cerro Punta grows almost 90% of all the vegetables consumed in Panama. The town boasts a 2 kilometer paved airport, although no airline currently services it, and several volcanic lakes. The main city of David is just 45 minutes drive south. A new 32 bed, 24 hour emergency hospital has opened. The town currently, has 10 large supermarkets. There are three banks, 2 with ATM's and 3 gas stations. At the last count there were over 30 places to eat out. You can still buy a breakfast with coffee for less than $1.50. Fresh fruits and vegetables are available at several road side stands. The nearby Amistad National Park has thousands of acres of pristine wilderness to explore. To the east of town stands the majestic 11,400 foot Baru Volcano. Yes it is classed as active but hasn't had an eruption since around 1450. Just outside the map are two large hotels the DOS RIOS and the BAMBITO. However, we do have several cabins, B&B's and a Lodge all within walking distance of the centre of town. To COPY the map, just right click then cut and paste.